A feature that has been teased by several tech giants, Royole has been able to launch it first. Indeed, the American company has unveiled the first commercial foldable smartphone, the FlexPai. Equipped with a 7.8-inch AMOLED screen which can be folded, FlexPai is one of its kind. 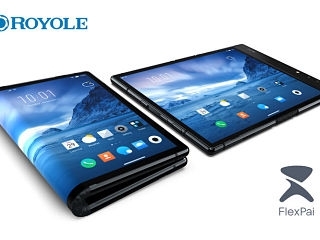 Indeed, Royole is the first brand to present a bendy smartphone which can turn into a tablet as well. The device is fitted with a special hinge enabling 200 000 folds as well as twists. Running on the brand’s own user interface called Water OS, FlexPai is also equipped with the Android 9 Pie software. Furthermore, it is expected to feature a Qualcomm Snapdragon 8 series SoC. The Royole phone will come in three different versions, ranging from 6 to 8 GB of RAM and with 128, 256 or 512GB of storage. A dual camera setup of 20 MP and 16 MP is also part of the mobile. Launched in 2012 by Stanford engineering graduates, the business has beaten some of the biggest companies by releasing the FlexPai. Indeed, Samsung is planning to unveil a similar phone, the Galaxy X, at the upcoming Developers Conference. The business is mostly known for its work in the field of advanced flexible displays, sensors, and smart devices. Despite having officially introduced the FlexPai, Royole stated that the phone/tablet is not the final product. It is currently known as the ‘Developer Model’ and is priced as from $1,300 to $1900. - The Samsung Galaxy Fold has been announced!